During two campaign stops in Oakland County on Monday, 2020 presidential hopeful Kirsten Gillibrand argued that access to clean water should be a human right. The New York U.S. senator said that people affected by the Flint water crisis should have access to full health monitoring. She added that tracking the health of those affected by the Flint water crisis would be similar to a 9/11 health bill that she was instrumental in passing through the U.S. Senate. Gillibrand said she wanted to hold a town hall in Michigan because people here felt their voices weren’t heard in 2016. “Michigan is a lot like where I’m from. I think these are the places that very much felt left behind in the last election. They didn’t hear their stories being talked about enough and so they didn’t feel like the Democrats were going to help them,” Gillibrand said. In addition to the MSNBC town hall, she also held an event hosted by Fems for Dems in Clawson, where she was joined by Gov. Gretchen Whitmer and Attorney General Dana Nessel. 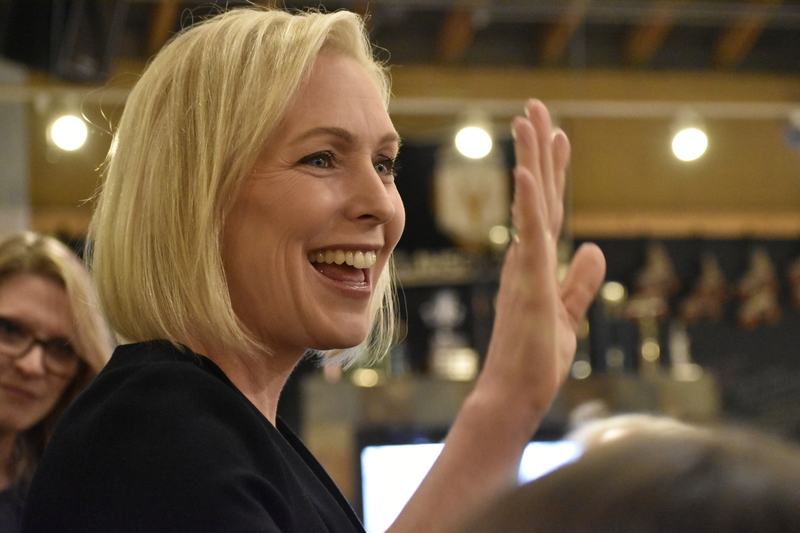 Gillibrand argued that she is the best person to turn Michigan blue in 2020, noting her electoral history in the state of New York. She started her career by flipping a Republican congressional district and has since won the most votes of any statewide candidate in New York, including from red, purple and blue areas of the state. Beyond winning the 2020 election, Gillibrand said this will help her to breach divisions in the country and effectively govern, working with both Democrats and Republicans. But Gillibrand did discuss several policy proposals that Republicans are unlikely to work with her on. Chief among them is the Green New Deal, a policy to combat climate change championed by progressives. “The Green New Deal is actually pretty simple. It’s three things: it’s infrastructure, it’s job training for green jobs and it’s clean air and clean water. All three things that Michigan needs,” Gillibrand said. Shortly after the conclusion of her events, the Republican National Committee (RNC) slammed Gillibrand’s proposals and argued that her campaign is dead on arrival. In an unprecedented move, President Donald Trump’s campaign recently absorbed the RNC’s operations. And while the president declaring a national emergency over border security continues to be debated in Washington, D.C., Gillibrand pointed to the relationship between Michigan and Canada as a prime example of how we should handle border and immigration policies. Gillibrand’s town hall was attended by several Democratic leaders, including new Michigan Democratic Party Chair Lavora Barnes and Abdul El-Sayed, who lost his gubernatorial race against Whitmer in the 2018 Democratic primary. While Gillibrand endorsed Whitmer over El-Sayed in 2018, she told him after the town hall taping concluded that “his voice matters” and encouraged him to run for office again. Gillibrand was the first candidate to schedule a campaign event since Whitmer tweeted an open invitation for presidential candidates to visit the state last month. However, one of her rivals in the Democratic primary – former Texas U.S. Rep. Beto O’Rourke – made it to the state earlier in the day for three campaign stops. Gillibrand gave shout-out to Whitmer when announcing her run for president during an appearance on “The Late Show with Stephen Colbert” in January. Colbert gave Gillibrand a gift basket of campaign essentials, which included a plane ticket to Michigan. According to a spokeswoman, Gillibrand did not use that plane ticket to travel to Michigan on Monday. Andrew Roth has been covering Michigan policy and politics for three years across a number of publications and studies journalism at Michigan State University.